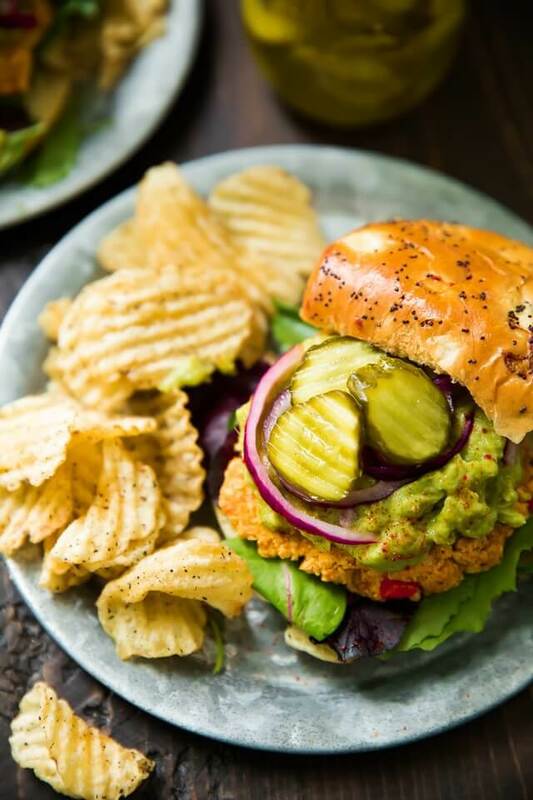 We all know and love a good veggie burger, but this sweet potato veggie burger with avocado takes that love to a whole new level! Try for that outdoor summer barbecue or share on a platter for football party season. These sweets will be a hit with everyone. For guacamole topping use this recipe! Bake, microwave, or boil your sweet potato until tender. Remove/discard potato skin and, using a food processor or blender, puree the sweet potato until smooth but thick. Transfer the sweet potato to a large mixing bowl. Next, add rinsed garbanzo beans to the food processor. Pulse just a few times to break up the beans, still leaving lots of texture. Add beans to large mixing bowl with sweet potato. Add bread crumbs to the sweet potato mixture. Then, sauté bell pepper, onion and celery over medium-high heat. Once your veggies are cooked, add them, along with the egg and seasonings to the bowl with the sweet potato mixture. Stir to incorporate and divide burger mixture into 6 balls. Cup each ball in your hands and squeeze, pressing it into a round compact patty. Refrigerate patties for approx. 30 minutes to set. To cook, spray a large skillet with cooking spray and heat over medium to high heat. Cook for a few minutes on each side until the patty is golden and the center is warm. Cooking times will vary a bit depending on the size of your burgers and type of pan/skillet used, so aim for a crispy outside with a warm tender center. Once done, pile a lightly toasted bun high with greens, patty and top it off with a generous helping of guac and dig in!